Home Page - Pick34Bible.com - Pick34 Bible - Number Secrets Uncovered! It is a pleasure to see you here. Finally the Pick34 Bible went online. You are now able to access the current and preview numbers online without waiting for the mailman or an email. 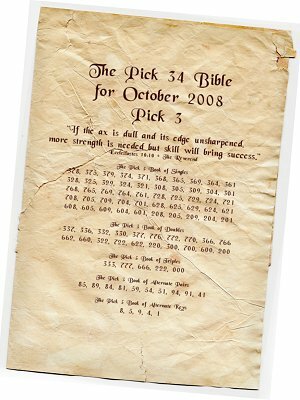 What is the Pick34 Bible? The Pick34 Bible is one of most comprehensive Monthly publications for the avid Pick 3 and Pick 4 player. The Book starts out with a selected monthly saying from the bible and by establishing a group of numbers it provides a selection of numbers to play. These numbers are structured into 3 Pick 3 Books (Singles, Doubles and Triples) and 4 Pick 4 Books (Singles, Doubles, Triples and Quadruples). In addition the Bible gives you the most likely alternate keys and pairs selection to improve your personal selections even further. You can find more about the background on the INTRODUCTION page. © 2014, Pick34Bible.com. All rights reserved. Information from this site may not be redistributed in whole or part. Hosted and developed by tenesy.net. Design by the German Cowboy, Nashville TN.